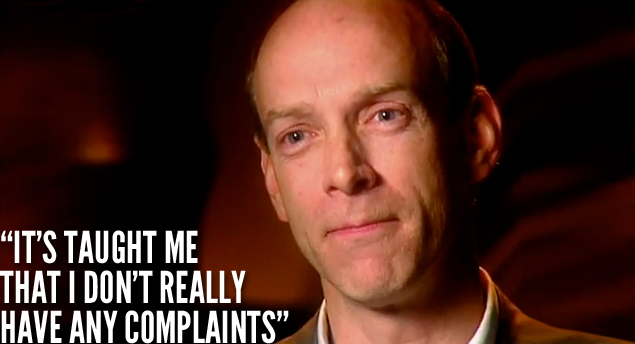 While I admire Patrick’s attitude and fortitude, my favorite part of the story is Patrick’s dad. The video briefly mentions dad’s schedule. Dad works the graveyard shift at UPS so he can take care of his son. In our culture, we throw around superlatives like “awesome” or superlative statements like “the greatest thing I’ve ever seen,” for far too many things. But in this story it is appropriate to say that Patrick’s dad is exemplary. He is “serving as a desirable model; representing the best of its kind.” How many dads do you know that would work a job in the middle of the night so he could take care of his special-needs son during the day? That is exemplary. Let me also mention this: mom was hardly mentioned in the story, (though I suspect that Patrick’s mom and brothers must be exemplary too). This site is primarily about manhood…biblical manhood. In the beginning (Genesis), God gives Adam all kinds of responsibility. God gives him the responsibility of naming the animals, the responsibility of working and caring for the garden, and the responsibility of loving and caring for a woman, his wife, Eve. When Adam & Eve sin, God comes to Adam first. While Eve is held responsible for her sin, Adam is held responsible not only for his sin but also for that which is under his authority. My point is this: Patrick’s dad (whose name is Patrick John) has taken seriously the responsibility of being a father and it shows through his actions of loving and taking care of his son, whom God has given to him. Would I give up my vocation so that I could work the graveyard shift so I could care for my special needs son during the day? Would I be willing to go back to college and take notes, so that I could help my son get a college degree? 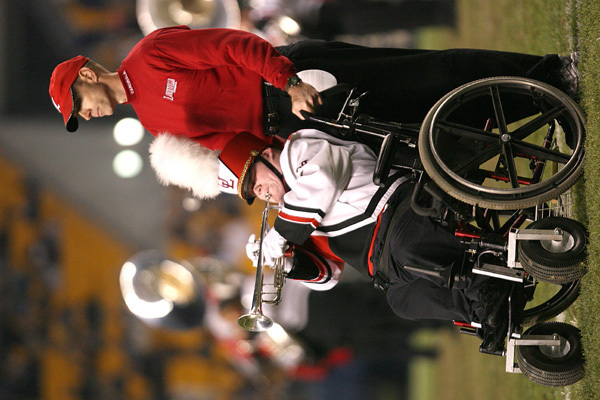 Would I be willing to push his wheelchair for 2 hours a day so he could be in the marching band? Would I be willing to travel with the marching band so my son could play? I hope that I would happily lay down my own selfish desires and serve my family the way that Patrick John has chosen to serve his family and son. I’m grateful for a man that decided to look past the limitations, and open his eyes to the gift that God gave him. Patrick John, thank you for showing me what masculine responsibility looks like in this situation. Thank you for serving your family. Thank you for being a man.